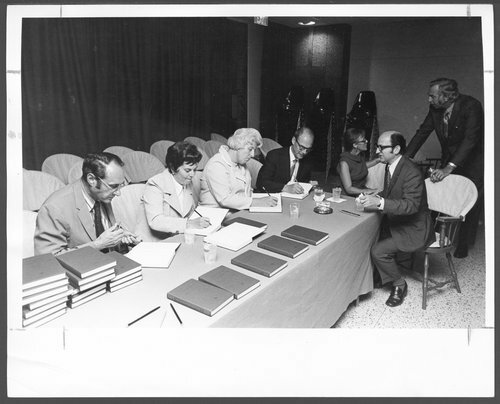 This photograph shows the autographing party for copies of the final report on Psychotherapy and Psychoanalysis. Shown are Dr. Len Horwitz, Dr. Ester Burstein, Dr. Lolafaye Coyne, Dr. Harold Voth, Dr. Ann Appelbaum, Dr. Ott Kernberg, and Dr. Roy Menninger. The Menninger Foundation is a non-profit organization devoted to treatment, training and research in mental illness. This book was a landmark in research.